Age of Empires: Definitive Edition is available on the Microsoft Store from February 20th 2018. 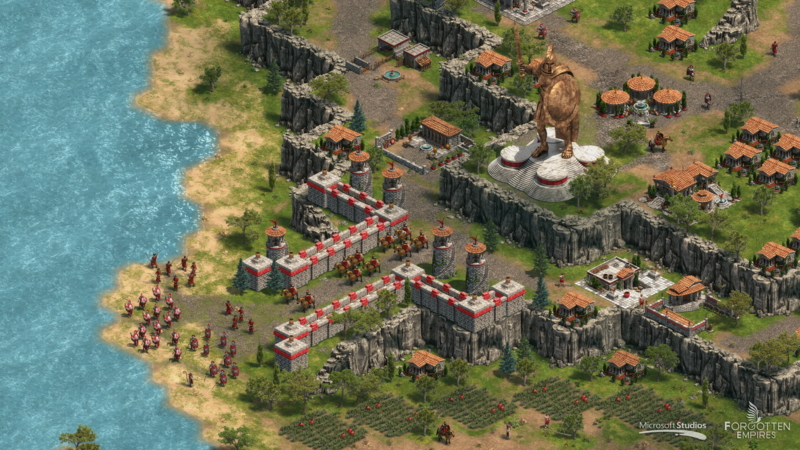 Play all the civilizations from the original Age of Empires and the Rise of Rome expansion! Assyrians – Restore the might of the Assyrian Empire under Adad-nirari II and terrify your enemies as the supreme Assyrian archers darken the sun with the shafts of their arrows. Babylonians – Walk through the Ishtar Gate, ascend ziggurats, and explore the great city of Babylon, a testament to your people’s mastery of stone masonry. Its palace garden, a wonder of the world, was truly paradise on earth. 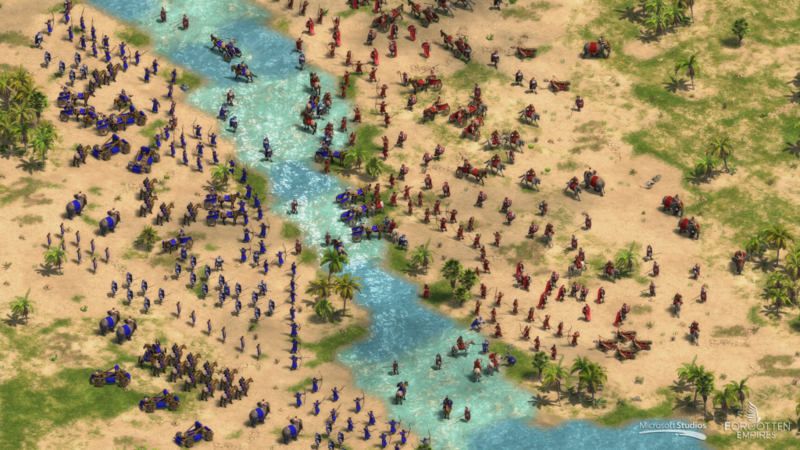 Carthaginians – Lead Carthage from city-state to empire and challenge the might of Rome with menacing war elephants and an indomitable navy. Choson – Control the advanced kingdom of Gojoseon and expand your territory by alliance or through the might of your powerful swordsmen. Egyptians – Sail the Nile River, construct massive pyramids to send your pharaohs to godhood, and lead armies of powerful charioteers as you vie for control of the rich lands of Canaan and the Levant. Greeks – Establish colonies using your mobile fleets, resolve internal conflicts, and command armies of swift hoplites as you expand your domain. Hittites – Pouring out of the rocky hills of Anatolia, the Hittites were the terror of the Near East. Lay waste to enemy cities with armies of skilled bowmen and durable siege engines. Macedonians – Relive the conquests of Alexander the Great at the head of an army of disciplined infantry and powerful siege engines, building a vast empire stretching from Greece to India. Minoans – Construct vast fleets of ships and build a Mediterranean trade network that will be commemorated on the vibrant frescos within your grand palaces. Palmyrans – Rising out of the sands of the Syrian Desert, Palmyra built its hegemony on trade and commerce. Defend your caravans and raid your enemies with swift camelry bred in the harsh desert. Persians – Throw off the Median yoke, conquer Babylon, and build a diverse empire stretching from India and Egypt to Thrace. Powerful elephants will trample anything that stands in your way! Phoenicians – Invent the alphabet, fashion sturdy ships from the famous cedars of Lebanon, and lead voyages throughout the Mediterranean. Distant lands and the vast seas beyond the Pillars of Heracles await! Romans – Draw your gladius and emulate the tactical brilliance of Caesar and Trajan as you lead the fabled Roman legions from humble beginnings to mastery of Europe and the Mediterranean world. Shang – Reap the economic benefits of the fertile Yellow River valley and construct massive fortifications to repulse nomadic invasions from the northern steppe. Sumerians – Cultivate the rich soils of Mesopotamia, invent writing and the wheel, and wage the wars of Gilgamesh and Sargon. No enemy city will withstand your fearsome siege engines! Yamato – Take command of sturdy fleets and large cavalry armies as you vie to unify your hardworking people and forge the Empire of the Rising Sun. Fight your way across antiquity and relive some of the most famed campaigns from the Stone Age all the way through the Iron Age. A very special word of thank to all the people who have helped us on this project!